Parthiv Patel struck a whirlwind half-century to enable India thrash England by eight wickets in the third Test at the Punjab Cricket Association IS Bindra Stadium here on Tuesday.Patel stormed to 67 runs off 54 balls as India overhauled the 103-run target a short while after the tea break on the fourth day of the Test.Indian skipper Virat Kohli remained unbeaten on six runs at the other end. Patel hit a boundary to overhaul the target in style as India finished their second innings at 104/2.Pacer Chris Woakes and leg-spinner Adil Rashid bagged a wicket each for England.India now lead the five-Test series 2-0. The hosts had won the second Test in Visakhapatnam by 246 runs while the first match of the series had ended in a draw at Rajkot.India thus maintained their record of not losing a Test match at this venue for the last 22 years. The first Test hosted by this venue was in December 10-14, 1994, which saw then cricket powerhouse West Indies beat India by 243 runs.Resuming the fourth day's play at the overnight score of 78/4, England lost quick wickets to end their second innings at 236 runs. Haseeb Hameed posted a half-century in difficult conditions to remain unbeaten on 59 and help take England past the 200-run mark.The visitors were all out for 283 runs in their first innings while India had posted 417.Chasing a paltry target of 103, Patel started off India's second innings in confident fashion with a boundary through the covers off Woakes.Vijay, howver, continued his run of poor form, edging Woakes to Joe Root at second slip later in the same over.Pujara then joined Patel in the middle and the duo ensured that there were no more hiccups till the tea break. Pujara, who scored 25 runs, perished after tea while attempting to sweep a Rashid delivery which was pitched a little outside leg-stump. 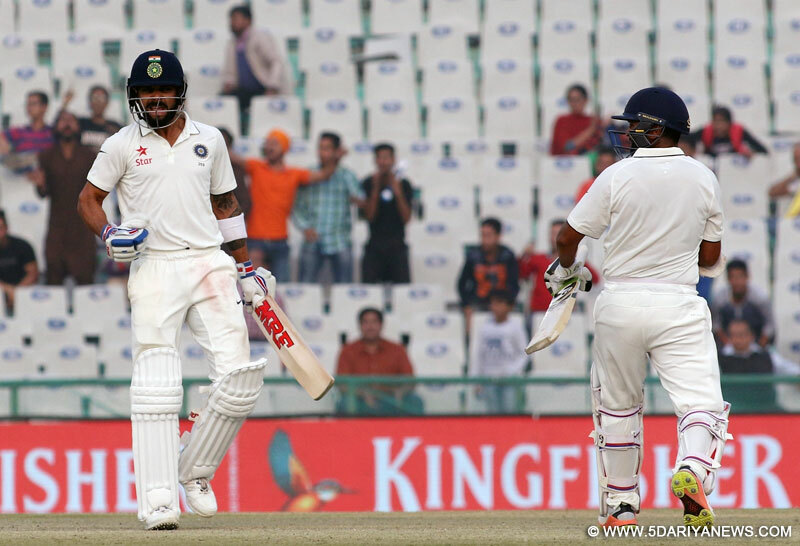 The Saurashtra batsman misjudged the bounce and ended up offering a top edge to Root at short fine leg.As Kohli joined him at the other end, Patel continued to go after the England bowlers to end up with 11 boundaries and a six, and India won in dominant fashion. Ravindra Jadeja, who posted his career best Test score 90 runs during India's first innings and also bagged a total of four wickets, took home the Man of the Match award.Earlier, striding to the middle with England tottering at 107/6, Hameed was involved in crucial partnerships with Root, Woakes and James Anderson.The opener, who was forced to come in a number eight due to a hand injury, batted patiently for 156 deliveries to be unbeaten on 59, hitting six boundaries and a six.Hameed and Root were involved a 45-run partnership before the latter edged Jadeja to Ajinkya Rahane in the slips.Root was the top scorer in England's second innings with 78 runs off 179 balls which included six hits to the fence.For India, star off-spinner Ravichandran Ashwin ended up with figures of 3/81 while Jadeja, Mohammed Shami and Jayant Yadav bagged a brace each.England lost three wickets in the morning session to reach 156/7 at lunch. Jadeja, who opened the proceedings for the hosts with fast bowler Umesh Yadav, struck twice before lunch to give India the upper hand.Jadeja trapped night-watchman Gareth Batty (0) plumb in front in his very first over of the day before dismissing make-shift opener Root just before the lunch break.Off-spinner Jayant Yadav piled on the misery for England by dismissing danger-man Jos Buttler (18).Hameed and Woakes then added 43 runs between them to take the visitors near the 200-run mark before Shami produced some excellent short pitched bowling with the second new ball to hasten England's demise.Shami used the short pitched stuff to good effect by dislodging Woakes and Adil Rashid in the same over.Bowling his first over with the second new ball, the Bengal fast bowler produced a sharp bouncer with his opening delivery which hit Woakes on the helmet.The Englishman was clearly shaken by the blow and had to pause for a drink as the England physio came out to check on him.Shami came up with another bouncer with another bouncer in his very ball which came into Woakes, hitting the handle before lobbing up for an easy catch to wicketkeeper Parthiv Patel.Rashid, the next man in, was hit on his pads with the first ball ball he faced before another incoming short pitched ball forced him to offer an easy top edge to Umesh at fine leg.Hameed then joined up with Anderson and continued to defy the Indian bowlers.Despite facing some excellent bowling on a difficult pitch, the teenager mixed caution with aggression, bring up his half-century with a six off Ashwin's bowling.Hameed's aggression saw him add 41 runs in 40 balls along with Anderson before the latter was run out thanks to Jadeja's throw from the deep, thus bringing an end to the England innings.